Today there is the first round of the Presidential elections in France. According to the latest polls, it seems that Hollande is going to win with Sarkozy coming second and the two going to the second leg of the elections. After my flying class today, I took the opportunity to go to one of the “bureau de vote” installed at the city hall in Capitole square. As I did 7 years ago while living in Aachen (then with the election between Merkel and Schröder), I wanted to check first-hand how the voting works here in France. 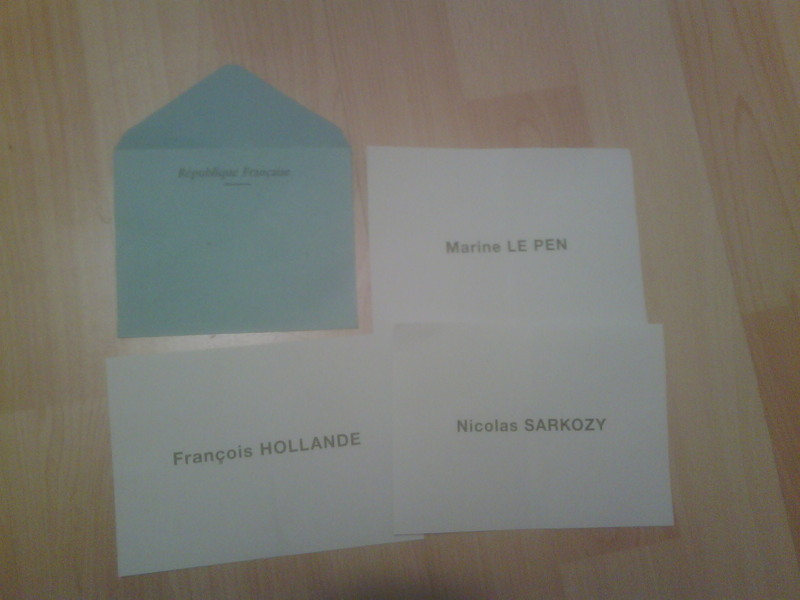 French Presidential election 2012: Ballot papers. It raised my attention that there were many isoloirs, these cabins with curtains where you decide which ballot you place in the envelope. There are those as well in Spain. I did this detour today with a colleague coming from the Spanish Basque Country, he mentioned that in his village people also uses those cabins. However, in the village where I come from in Madrid, people almost never uses them. While I agree that their presence is a must, the need to use them is sad. Finally, the rest of the process is the same. The voter comes to the table, hands her ID to the president of the table, the name is checked in the list and the voter places her vote in the urne.